So much has been written , shared , and discussed about biryani. I have had so many requests for an easy biryani and always wonder if there are shortcuts to simplifying such a complicated dish? Well…. with due respect to all the chefs and experts on biryani, I do believe that sometimes we can create a simpler version of an elaborate dish. Today on daughters day I share with all of you what we created together. In a blender ( i used my magic bullet) add the yogurt, some salt, the ginger garlic and some green chillies. Add half the garam masala. Blend it together and marinate the boneless chicken for a few hours. While the chicken is marinating lets cook the rice. Take about 8 cups of water and put it to boil with some salt and the whole spices. Boil it for about 5 minutes after coming to a boil so that the water is very fragrant. Then with a small sieve strain out all the spices. Put the spices in the blender (magic buller) and blend it. Put the rice in and cook it for about 5-6 minutes till about 75% cooked. Drain in a sieve and pour cold water over the rice. Divide it into 4 portions . Put the saffron into one portion and mix carefully. Color the other portions into the colours you like. You can even make more portions and use more colours. Leave the rice to cool and absorb the colours. Heat the oik in a pan and add the onions and sautee till it starts getting slightly browned. Add the tomatoes and cook till its all smashed and mushy. Add the blended spices and the garam masala and cook for a few seconds.Then add the marinated chicken and turn up the heat. Quickly toss till chicken is about done. Add the green chillies, coriander leaves and mint. Turn off the heat. Take a glass dish and lets assemble the biryani. 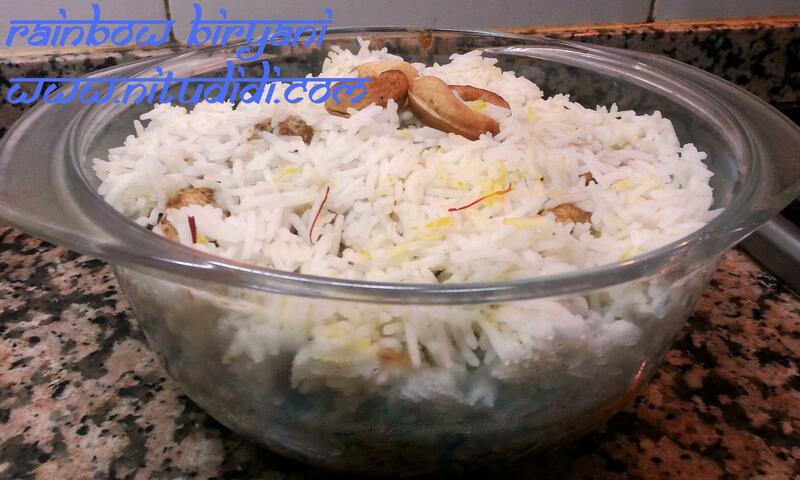 Put a layer of rice of one colour on the bottom of the dish. Spoon some of the chicken with the sauce ontop. Follow with another layer of rice of a different colour and again top with some chicken. Make layers like this and use the saffron rice as the topmost layer. Cover with a microwavable cover and heat in the microwave for about 5-6 minutes till you see the rice thorougly heated through. Decorate with the cashewnuts and serve. This is a biryani that everyone can make. If making with soya chunks, soak the soya chunks. Boil them in water till they soften and rinse in cold water. Proceed to marinate. This entry was posted in Chicken, Ideas for meals, Indian Restaurant Dishes, Magic Bullet, Rice is Nice, Saffron and tagged biryani chicken rice. Bookmark the permalink.